I’m not usually one for system-dense RPGs, but Darkest Dungeon gets me. I usually find the abundance of stats and special terms to be stressful, and this game only makes that worse with its randomization and permadeath. While most difficult games really only feel like a struggle to the player, Darkest Dungeon has the in-game characters stressing just as hard and freaking out after every blow. It’s a weirdly relatable experience, seeing the player’s struggle mirrored and amplified through the characters on screen. It makes sense that everyone in-game is so down in the dumps – this Lovecraftian tale is full of grotesque horrors, unpleasant locales and covered with a ceaseless sense of despair hanging. Braving the Darkest Dungeon won’t be for the faint of heart, but it will be rewarding to those who face the darkness head-on. Eldritch horrors – Combat in Darkest Dungeon is a clever spin on turn-based battles. Presented almost as if it was a sidescroller, your team is a single-file line of up to four combatants. The key to combat is to pay attention to positioning: every single move in the game has a defined position, so if your character isn’t standing in the right spot, or there isn’t a target in the right spot in the enemy lineup, the move is locked out. In practice, it makes sense; melee fighters tend to be more effective leading the pack, while archers and healers do better farther from the enemy. There’s a variety of classes each with customization movesets, so you can make someone specialize in one spot or be effective from anywhere. It’s important to have an ideal team order, but some enemy attacks can shuffle your order. A character can switch spots on their turn, but it is done in lieu of attacking. Enemies follow the same positioning rules, but have an advantage due to corpses – the bodies of fallen foes remain in the lineup until you clear them out with further damage. When your characters die, they’re gone for good, but can potentially remain in a health-less Death’s Door state long enough to save them or at least go out swinging. 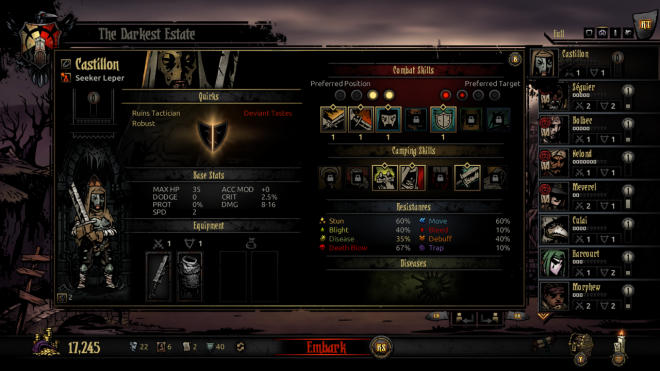 Lurking fear – What makes Darkest Dungeons’ RPG elements special is the inclusion of stress. Located under the health bar, everyone has a stress level that increases the more they adventure. It could be due to enemy attacks, a teammate’s death, an unlucky occurrence or merely being in such an unpleasant place. Stress can be relieved through buffs or lucky happenstance, but these are rarely enough to curb the loss of sanity. Once their stress bar fills up, a character’s resolve will be tested. They’ll either succumb to the stress and gain a negative attribute, or rise above it and gain something positive. If their stress bar fills up again, they’ll potentially have a heart attack and die. Stress levels can be reduced between excursions through various activities in the hub, for a cost. A major part of the game is maintaining your hero bench and cycling through various team makeups, so the healthy can adventure while the wearied recuperate. The more stressful situations a character endures, the more they’ll be able to handle later on. Bringing a fresh recruit on a difficult journey will drive them mad fairly quickly, while a seasoned vet will remain steadfast. While standard RPG statistics like attack and defense can be leveled up, improving mental stamina is the most important sign of progress. Endless abyss – Battles are great, but are merely highlights in the greater expedition. From the mission select screen, you pick from five locales, each with an assortment of randomly generated missions for you to pick from. No matter your choice, you won’t be able to escape until you finish your task or run away at the risk of doing more harm to the survivors. Before embarking, you get the opportunity to purchase provisions. Aside from buying items to heal various maladies, you also need food to combat hunger, shovels to remove debris and torches to light the way. It’s essential to stock up because not having enough will only lead to more dangerous situations. Exploration seems almost too simple at first; you move your team forward using the left stick, and when you reach a branch in the road you decide a path with the right stick. Battles may happen randomly in passageways but are more often relegated to the connecting rooms. It’s a simple setup, but the moments of just walking down hallways can be the most game-changing. Your torch’s light will constantly decrease unless re-lit, which is important because enemies hit harder in the dark. It’s also important to keep an eye out for traps, which will hurt your party if walked upon. You’ll also come across treasure chests, shrines and various other curiosities. Interacting with them can net you loot or buffs, or curses and physical pain. You can select which character performs actions using the left and right bumpers, or just ignore these gambles altogether. Longer dungeons add even more depth through camping, allowing your team to recuperate and get an added boost through everyone’s unique camping abilities. Walking in a straight line may not sound like exciting exploration, but you risk every step being your last. Shadow over the hamlet – Between excursions, you’ll visit the hamlet, the game’s central hub. There you can level up equipment, customize move sets, reduce stress, remove or enforce attributes and hire new explorers before you descend back into darkness. Every function is housed within its own storefront, all of which can be leveled up to improve their usefulness. Functionally this feature is fantastic, providing a ton of customization options and a welcome calm between storms. The problem is the menus upon menus, presented in a way that’s incredibly unfriendly in a console setting. You move through options with the left stick, but holding the left trigger will either give you details on the highlighted item or pulls up the upgrade page within a store. Using the right trigger will move you through your character bench to rearrange them or select them for the next mission. You can see each character’s stats by pressing X, which is never explicitly mentioned and took me way too long to figure out. You can view your stat-boosting trinkets at any time by pressing Y, but you can only use this menu to assign trinkets if you already had a character’s stat card up. The interface makes more sense on PC with a mouse, but on consoles this information-dense setting should have been more streamlined. Core gameplay fares better but still has some weird controls, most notably the frustrating map. They tried their best to show buttons for menu navigation, but even that doesn’t help decrypt its non-intuitive nature. Sense of futility – The main goal of the game is simple – get a crew strong enough to survive expeditions into the Darkest Dungeon. 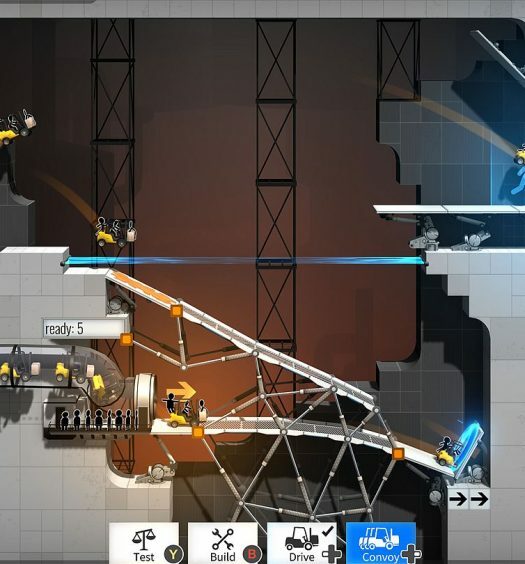 Four additional areas provide simpler tasks for leveling up, and each has unique side quests and boss battles. You’re given a laundry list of quests to complete in any order, each one incredibly unique and memorable. I particularly love the boss battles, which are tough to down and throw in many new, unexpected mechanics. These moments are great, but the moments between are dull. When you’re not doing a quest mission, you’re just doing standard fare, trying to level yourself up and unlock the next big event. While there’s a wide variety of possibilities in moment-to-moment gameplay, the larger mission structure feels too familiar too quickly. These smaller moments have potential, but more often than not feel like a grind. Darkest Dungeon is sadistic. Its gameplay is unforgiving, with any situation taking a turn for the worst at any moment. The art style is gritty and monsters unsettling. Its narrator speaks of hopelessness even in the brightest moments. Playing the game will make you question your sanity because despite its unpleasantness it’s incredibly addicting. The turn-based combat is challenging but rewarding, making every adventure an intriguing risk worth taking. The adventure may not always be satisfying, but there are many harrowing tales just waiting to be told. 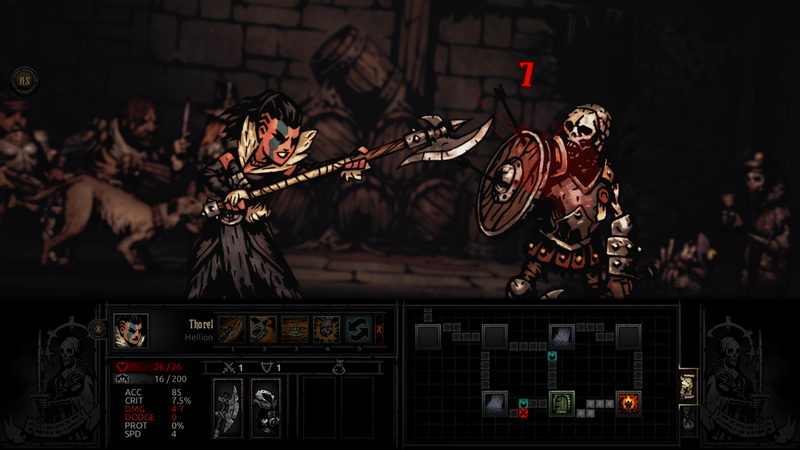 Darkest Dungeon was developed and published by Red Hook Studios. It was released on February 28, 2018, for $24.99. A copy was provided for review purposes.